Beckett and Italy. As a student at Trinity College Dublin, Beckett studied Italian language and literature, and cultivated them privately with Bianca Esposito, the signorina Adriana Ottolenghi of ‘Dante and the Lobster’. They discussed the writers on his syllabus: Machiavelli, Petrarca, Manzoni, Boccaccio and Tasso, to name a few. His most striking encounter was with Dante – he read the Commedia many times throughout his life – and he also discovered a particular affinity with Leopardi. As a student, he wrote essays on Carducci and D’Annunzio. He attempted translations of Dante into English in letters and notebooks, and wrote a curious dialogue in German based on Ariosto’s Orlando furioso. In 1930, he published translations into English of Montale’s poem ‘Delta’ and texts by Franchi and Comisso. For a good part of his formative years, Beckett really was, as Walter Draffin in Dream of Fair to Middling Women, an “Italianate Irishman”. His interest extended well beyond literature. For example, he read the philosophical investigations of Bruno, Campanella, Thomas Aquinas and Vico. Moreover, he was interested in Italian music, was fascinated by Italian art, and followed with curiosity the experiments of Neorealist cinema. Yet Beckett’s relation to Italian culture is far from unambiguous. For example, despite his knowledge of the language, Beckett’s involvement with the Italian translation of his work was negligible. Comments like the one quoted above, where, while denying the “italianità” of his work, he draws attention to “a number of Italian elements” in it, are a testament to both the ambiguity and the vitality of this relationship. These two conferences aim to re-assess the influence that Italian culture, literature, poetry, theatre, arts and cinema had on Beckett’s works, even beyond what he was willing to recognise. Italy and Beckett. When Godot was first performed in Italy in 1953, the first Italian-language production coming a year later, Beckett was greeted as a playwright who belonged to the Theatre of the Absurd. Meanwhile his prose was mostly ignored or disregarded as minor. Eventually, Beckett found his place in literature, art, and popular culture; it is significant, in this light, that Calvino turned to him, in the last years of his life, and looked positively at his minimalism in Six Memos for the Next Millennium. Writers and artists felt – as they do today – the need to respond to the Beckett phenomenon, even if only to condemn his ‘literature without style’. Theatre directors welcomed his experiments and continue to propose innovative productions of his work. Critics have analysed him comparatively with writers like Pirandello, Levi and Gadda. More recently, much attention has been paid to the ties between Beckett’s writing and the philosophy of Agamben. In more general terms, there is room to investigate the way Beckett can help the exploration of the new avenues opened by the so-called ‘Italian Theory’, and, conversely, how the conceptual tools offered by this trend of thought can shed a different light on Beckett’s work. The recent publication of the Italian translation of Beckett’s letters seems to align with this continued Italian interest in Beckett. On the other hand, the fact that it is still difficult to find his work in bookshops, confirms the ambiguity of Beckett’s position in Italian culture. Each of these conferences aims to reconsider the impact of Beckett’s work on Italian culture. Beckett and Italian Politics, and Bio-politics. Further information about keynotes will be announced soon. 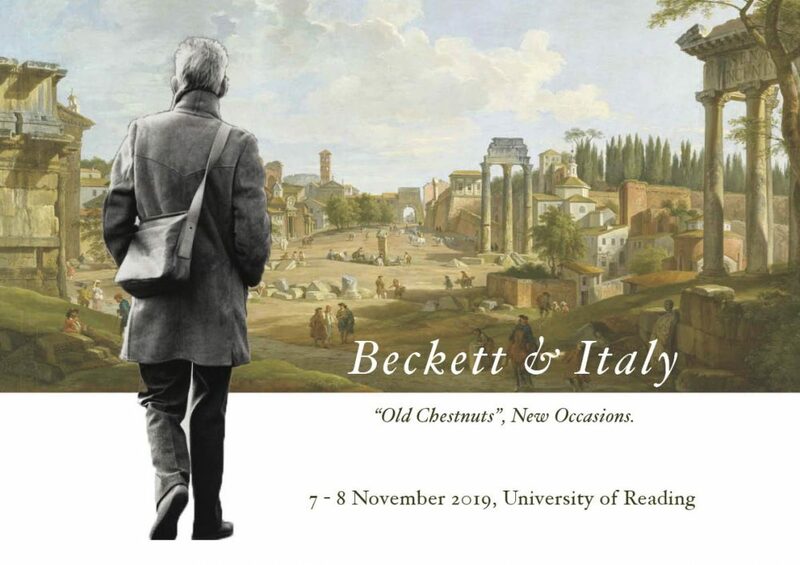 For the conference in Reading, please send anonymised abstracts, in English, of 300–500 words to beckettanditaly@gmail.com with a separate short bio of no more than 150 words by 16 June 2019. For more information, please email beckettanditaly@gmail.com. A separate call for papers for Rome will be circulated after the November conference in Reading.